Today is my first Inspirational Bereaved Parent Interview and post! I am super excited to be spending Saturdays posting interviews and guest posts from parents who are using their grief to create a legacy of love. If you have a story of how you have transformed your grief after child loss please check out my page for more information about being featured on Stillborn and Still Breathing as an Inspirational Bereaved Parent. 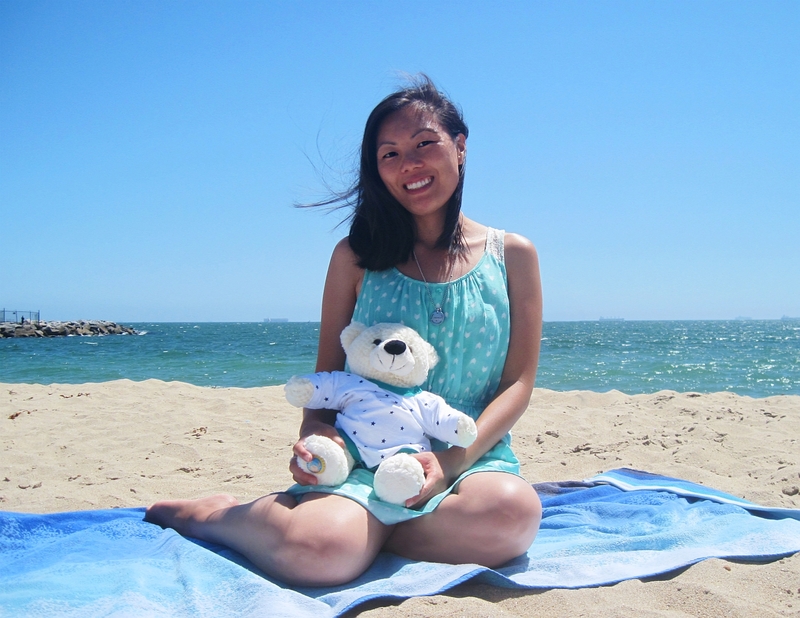 Now today I am honored to be interviewing Catherine, a fellow baby loss mom and blogger. Lindsey: Catherine, I am so excited to interview you today! I just finished participating in your Mother's Day Name Event and found it incredibly therapeutic. I know others felt the same way too as so many of the moms who sent me pictures of Nora’s name voiced the same sentiment. With this event you found a way to allow other grieving moms the opportunity to come together from all across the globe to honor and remember the loss and life of their child and their roles as mothers. Not to mention the opportunity to create connections with other bereaved mothers like themselves. That is pretty powerful stuff. Catherine: I’m really glad that the Mother’s Day Name Event turned out to be a healing project for so many baby loss mamas. That was the primary reason why I decided to put it together and even though we had some hiccups along the way, I think for the most part it was a success. Lindsey: After receiving the devastating news, during a mid-pregnancy ultrasound, that baby Gabriel would not survive outside of the womb, you bravely decided to carry him until as you say, "His soul went to Heaven." He was born into this world silently on July 19th, 2012. Then after the loss of your son, you created Sacred Seashores and Gabriel's Garden to honor Gabriel's memory. What motivated you to create these sacred places that help other bereaved parents with their grief through honoring their children either on the beach or in the garden through the beautiful photos you take in their child's name? Catherine: My greatest motivation has of course been Gabriel. I’m motivated to keep Gabriel’s legacy alive because I believe in it. I think that others, even those who have never experienced child loss can learn from it and live their lives a little better because of it. Gabriel’s Garden and The Sacred Seashore are parts of Gabriel’s legacy. They represent Gabriel’s impact on the world and all of the ways he’s making a difference in the lives of others, simply by sharing a little kindness, compassion and beauty with those who are hurting. It’s truly the little things we do with great love that end up helping people the most. That’s such an important lesson and yet few people ever learn it, let alone embrace it. I’m so grateful that my son once taught it to me and that I’ve been able to help others because of it. Lindsey: That is a powerful gift Gabriel gave you. Was transforming your grief and including Gabriel in that transformation in some way a necessary part of your healing process? After Gabriel died, I became determined to live out his legacy. As almost every grieving mother can tell you, my biggest fear was that one day my baby would be forgotten. I couldn’t let that happen when in my heart I knew that Gabriel’s life was special and meaningful. He may never have taken a breath of air, but he inspired a massive amount of love and joy and he impacted my life more than any other person. Everything I now know about life, I learned from him. Everything I do for others, including Gabriel’s Garden and The Sacred Seashore, I do to honor him and to defer focus away from his death back to where it belongs... his life and his legacy. Using my grief to keep Gabriel’s spirit alive has not only helped me to cope with his loss, but also to live a fuller and more meaningful life. Even though my life would be so much better if he was here, I don’t let that stop me from searching for happiness and healing and having the best life I possibly can. To me, Gabriel doesn’t represent what is absent from my life, but rather what is not missing. His loss magnifies everything that I do have and puts life into perspective. It’s impossible to put into words how blessed I feel to have a loving husband, supportive parents, true friendships and a safe place to call home, all things that I had before Gabriel, but never truly appreciated. Lindsey: I agree, it is so important to focus on what we still have while we're suffering, even if it is hard to do and I know I too appreciate the important things in life more. But to move forward through grief, I have heard sometimes it’s important for a bereaved parent to work through their own grief first before they can help others, but some find helping others part of their process towards healing. When did you know you were ready to take the next step to transform your grief into something healing? Catherine: Looking back, Gabriel’s Garden was really just a natural step in my grief journey. In the beginning I struggled with a lot of the same feelings that most baby loss mothers experience early on and I was really grateful for all of the support and care that I received from other moms who were further out on their grief journeys. Opening up yourself to accepting help from others is a really critical step in the healing process. Nobody is strong enough to go through the loss a child without any support and yet it can be difficult to ask for help. That’s why belonging to a community and finding people who understand what you’re going through is so important. For me, helping others was a natural step that followed all the steps I took to receive help. Gabriel’s Garden and The Sacred Seashore are such powerful healers for me because amongst many other reasons, they’ve allowed me to take more steps in my grief journey. I believe that progression, not time, is the healer of wounds which is why healing often feels like a never-ending road. It is. Lindsey: Do you have any other advice for newly bereaved parents or others looking to find something positive to do with their grief? Catherine: I’ve noticed that there are 2 types of grieving parents. The first is the person who focuses on their child’s death and is overwhelmed by it. They see life as unfair, cruel and ugly. Others feel sorry for them. The second is the person who focuses on their child’s life and is inspired by it. They see life as precious, sacred and beautiful. Others can learn so much from them. My advice is to strive to become the second person. It may take some time, but do what you can today to start heading in that direction. When Gabriel died, I realized that I had a choice in how I could live out the remaining years of my life. I could choose to spend the rest of my life hiding under the covers complaining about how unlucky I am and how unfair life is. Or I could give meaning to Gabriel’s life by living mine to the fullest and feeling grateful for all of my blessings - past, present and future. I chose the second option then, and I’m still choosing it today. You can also choose this path. Taking steps toward healing, showing appreciation for your life, counting your blessings and committing small acts of kindness are all positive things you can do with your grief. Every single day, do your best to leave behind feelings of bitterness and despair which ultimately only hurt you more. Instead focus on finding and spreading kindness, love, joy and beauty – these things will help you to heal and lead a better life in honor of your child. Lindsey: I could not have said it any better. Thank you Catherine for sharing your grief transformation story with us today. I know you are an inspiration to other bereaved parents as you are an inspiration to me as a grieving mom. You have helped so many through their journey of grief towards healing, including me. I thank you for that. Catherine: Thank you so much, Lindsey. You are absolutely an inspiration as well. Voicing grief and sharing it with others is a healing tool I would highly recommend to anyone and I’m so grateful that you encourage that openness in the baby loss community. You can find Catherine on Instagram where she takes beautiful photos or check out her blog Twinkle of Light. 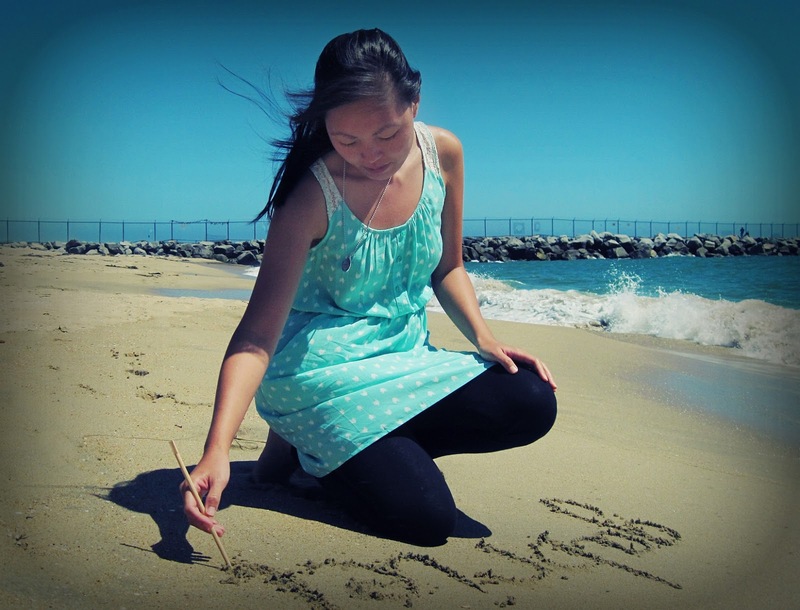 Catherine also has healing photography sites, the Sacred Seashore and Gabriel's Garden where you can purchase your child's name in the sand or have your child remembered through photos and poetry at Gabriel's Garden. Also, below you will see a sample of her work. 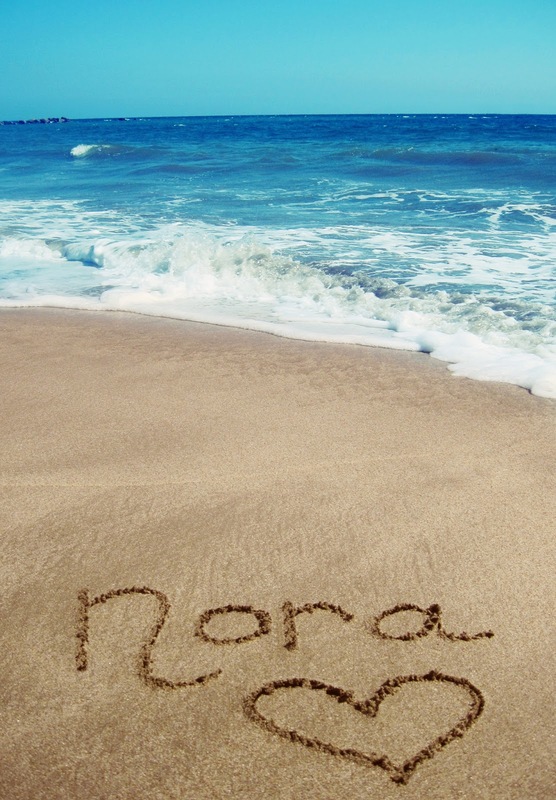 She made Nora's Name in the sand for me. So sweet and such a great artist! Thanks Catherine. I also enjoy reading both of your blogs. Very inspirational! Thank you both for this message!